We have Wide variety, Excellent Quality at Lowest prices under Brand name "Mc Clane". The Tower Bolts are available in Aluminium, Stainless Steel, & Brass in size starting from 4" upto 36". MC CLANE, ISO CERTIFIED 9001 : 2015, a renowned Premium Brand provides Complete Range of GLASS ARCHITECTURAL HARDWARE, Marketed exclusively by VINNI SALES, A-41, Mahendru Enclave, Gali No.3, G.T.Karnal Road, Azadpur, Delhi -110033, Patch Fittings, Shower Cabin Fittings, Pipe Glass Holder, Channel Glass Holder, Connectors, Spacers, Glass Bricks, Glass Locks, Glass Sliding System, Glass Automation, Spider Fittings, etc. ), Complete range of HARDWARE PRODUCTS - Mortise Handles, Pull Handles, Cabinet Handles, Door Stoppers, Door Silencers, Door Latch, Hinges, Piano Hinges, Auto Hinges, Hydraulic Hinges, Tower Bolts, Aldrops, Gate Hooks, Magnet Catcher, Locking Bolt, Pull Bolt, Indicator Bolt, Knobs, Kadis, Night Latch, Cyl. 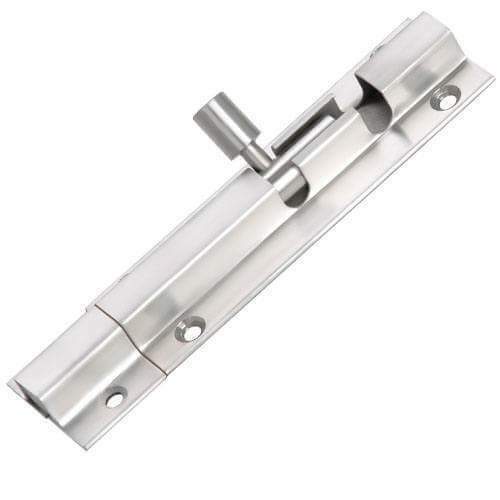 Knobs, Key Hole, Sofa Legs, Telescopic Channel,Kitchen Accessories, Curtain Accessories, Almirah Locks, Drawer Lock, Shutter Lock, Godown Lock, Rim Lock, Multi purpose Lock, Pad Lock, Dead lock, Sliding Door Lock, Door Closers, Door Eye, Profiles, Bed Bolt, Chair Wheels, Almirah Rods, Pipes, Bed Shocker, Magnetic Door Holder, Sixer Wheels, Ball Castor Wheels, etc) BATHROOM ACCESSORIES ( Soap Dish, Towel Holder, Napkin Holder, Soap Dispenser, Tooth Brush Holder, Magazine Holder, Glass Tumbler Holder, Glass Corner, Glass Shelf, etc. ) RAILING ACCESSORIES & KITCHEN ACCESSORIES. GLASSES, MIRRORS, DECORATIVE GLASSES, DESIGNER MIRRORS ADHESIVES TAPES & SCREWS (Fevicol, SR998, M.Seal, Araldite, Fevitite Rapid, Flexkwick, Silicon, Masking Tape, Packing Tape Clear/ Brown, Double Tape - Foam/ Red, Screws - Brass/ Ms/ SS) and many more. Our entire range is manufactured at our vendor’s end adhering by the quality standards and using certified basic components. Our products are quality tested on various parameters prior to its delivery at our customers’ end. WE ALSO UNDERTAKE ALUMINIUM FABRICATION & GLASS FILMING (on Quantity base orders only). We offer Online order placing facility. Our Company confirms order subject to 100% Advance. Payment thru RTGS/ NEFT or thru Bank Draft/ pay order. We are open Seven ( 7 ) Days from 9.30am to 8.00pm .